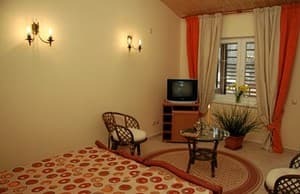 We offer you to have rest in Crimea, in the hotel "Golden Calf", which is located near the sea, in the beautiful mountains of Crimea - Zelenogorje. A wonderful place for recreation, corporate and family holidays and weekends. The majestic beauty of the surrounding mountains, clean and napoenny scents the air, the closeness of the sea, clean food, good infrastructure, hotels and quiet - no fuss. You will always find a place where you can be on your own. A week spent on vacation in Crimea, Zelenogore - is not just a vacation, but a real cure for the negativity of our nervous, stressful life. And once again plunged into the seething life of the Yalta restaurants or discos Sudak, returning to Zelenogore, you will experience the joy of touch with the real paradise on earth. 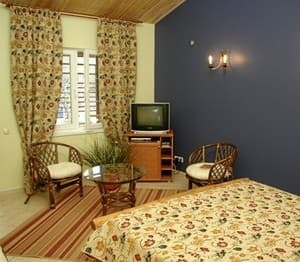 Description of the room: Spacious room (22 sq. M.) On the first floor of the hotel with an individual entrance. In the room beds with orthopedic mattresses, made to order from precious wood: oak, beech, hornbeam. A coffee table with two rattan chairs. The wardrobe and the TV table are also made of rattan. Accommodation of one additional place is possible. From the room there is access to an individual summer terrace of 11 sq. M, where a table and chairs are made of natural wood. From the terrace offers a magnificent view of the southern slopes of the mountains and the gorge "Panagia". 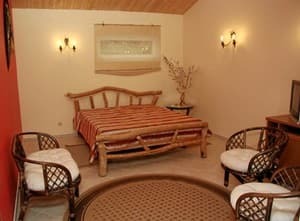 Description of the room: Spacious room (22 sq. M.) On the first floor of the hotel with an individual entrance. From the terrace offers a magnificent view of the southern slopes of the mountains and the gorge "Panagia". Accommodation of one additional place is possible. 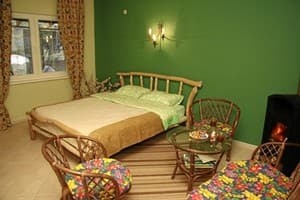 Description of the room: Spacious room (20 sq. 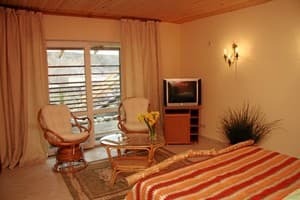 M.) On the second floor of the hotel with individual access to the terrace (20 sq. M.), Where a table and chairs are made of natural wood. The room has high ceilings made of natural wood, beds with orthopedic mattresses, made to order from valuable wood: oak, beech, hornbeam. Accommodation of one additional place is possible. A coffee table with two rattan chairs. The wardrobe and the TV table are also made of rattan. From the terrace offers a magnificent view of the southern slopes of the mountains and the gorge "Panagia". 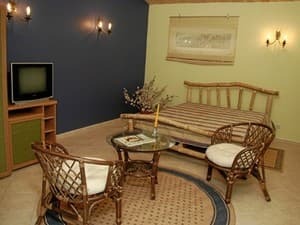 Description of the room: Spacious room (22 sq. M.) On the 2nd floor of the hotel with individual access to the terrace (20 sq. M.), Where a table and chairs are made of natural wood. 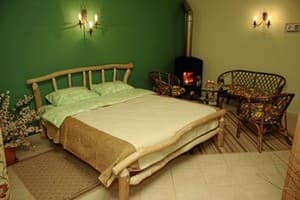 In the room there is a double bed with an orthopedic mattress, it is made to order from valuable species of wood: oak, beech, hornbeam. Accommodation of one additional place is possible. A coffee table with two rattan chairs. The wardrobe and the TV table are also made of rattan. From the terrace offers a magnificent view of the southern slopes of the mountains and the gorge "Panagia". Description of the room: The room is located on the first floor with a separate entrance. extra place - 80 Uah.